Get Ready For Ambience Fashion Weekend 2017 - Wedding Affair var admin_url = "https://weddingaffair.co.in/wp-admin/"
Every year Ambience Mall organises the Ambience Fashion Weekend, to celebrate the latest in designer wear for the fashion-conscious and the style-savvy. It is a great opportunity for mall-goers to pick their favourites out of opulent designer wear and to splurge before the festive season of Christmas and New Year kicks in. 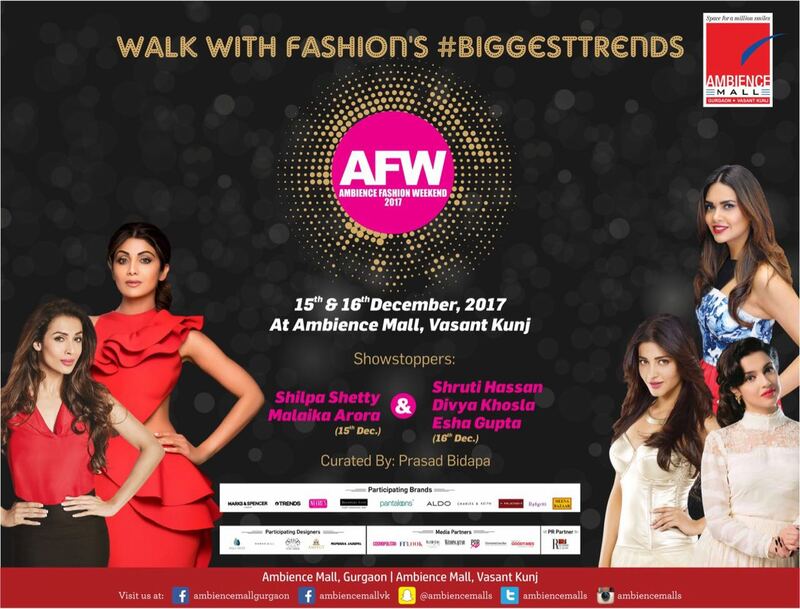 Like every year, Ambience Mall, Vasant Kunj, New Delhi, is organising Ambience Fashion Weekend 2017 on December 15-16, 2017 with top designers like Anju Modi, Rana Gill, Reynu Tandon and Amit GT coming forward to showcase their collections. Your search for some of the most extravagant designs come to a stop at the Ambience Fashion Weekend as it boasts of names and brands as diverse as Fab India, Ritu Kumar, Lifestyle, Shoppers Stop, Gems Opticals, Ruosh, Pantaloon, Biba, Rangriti, Anita Dongre, Wills Lifestyle, W, ALDO and Charles & Keith among others. These offer an eclectic mixture of styles to satiate the shopper’s heart, with a huge range of clothes and materials. The clothes are a vibrant mix and a blend of Indian, western and fusion wear. 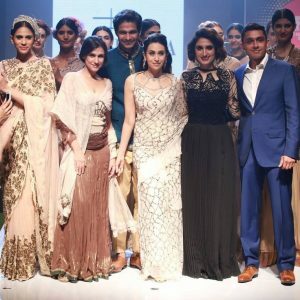 If you’ve been dying to spot celebrities, the Ambience Fashion Weekend is the perfect place to be! The show will be inaugurated by none other than the gorgeous and sultry Malaika Arora for Reliance Trends, followed by the very beautiful and talented Shilpa Shetty Kundra for Neeru’s. Other brands like Marks & Spencer, GEM Opticians, Rangriti, Meena Bazaar, Jack & Jones, ONLY and Vera Moda will also be showcasing their latest collections.​ These brands are household names which incite excitement amongst the masses. Come prepared for a fun-filled first day for retail while the second day is specifically for designer collections with an exotic splash of Bollywood. Some of the most prominent A-list stars will be gracing the runway. 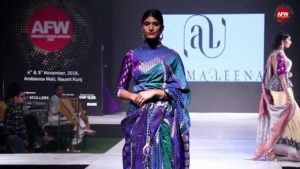 Shruti Hassan will start off the second day with Marks & Spencer, followed by Bollywood’s yummy mummy Divya Khosla Kumar will walk the ramp for Amit GT. Designers Rana Gill and Reynu Tandon will be also showcasing their collections. Esha Gupta will close the show by playing showstopper to the very-talented Anju Modi in the grand finale. The meeting of these two strands – retail and designer – will ensure happiness of the most sublime kind. Any shopper’s delight will also turn into a minefield for celebrities who belong to the glam world. If this is your cup of tea, make sure you visit the Ambience Fashion Weekend enjoy it to the fullest! Next articleMix and Match Mania!